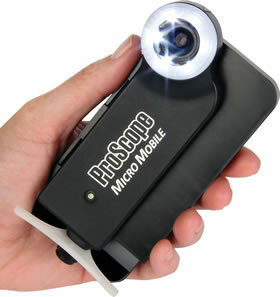 ProScope Micro Mobile, the world's first handheld digital microscope, is now adaptable to mobile devices. The first professional mobile microscope for our mobile device world. The new ProScope Micro Mobile uses custom coated glass optics to work with your onboard camera and provide superb quality images up to 80X. Built-in LEDs adjust to reduce reflection and are powered by a sleek rechargeable battery for up to 5 hours continuous use. Made with impact resistant Nylon and ABS for years of field, lab, classroom and exam room use. There are adapters for use with other camera-equipped smart phones and tablets. 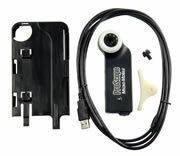 ProScope Micro Mobile is sold in a multi-device case which accommodates multiples SmartPhone models, and is also sold in popular kits specific to a device. See tables below for product specifications and comparisons. Compatibility Multiple iPhone, iPad, Samsung and Google devices - see individual products below. Also works with other camera-equipped smartphones and tablets (additional adapters may be required).